Back at work. All dressed up. I’m wearing tights and they’re bugging the hell out of me. Gravity pulls them down to areas that are not comfy on my body. But boy, it’s chilly in Los Angeles, and I need the extra warmth. First day back in the office, and I’m in a daze. I haven’t had much of my coffee yet. People are raring to go all around me, walking from office to office, getting things done, greeting each other with “Happy New Year!” I’m working quietly at my desk, as if I’m hung over from two weeks of pure comfort with my own time schedule. Two weeks of having my dog by my side, ready for a hike in the hills or a walk to the village. When others gain weight during the holidays, I lose weight. I don’t sit in front of a computer for long, nor do I sit by someone’s phone. I get up and do stuff. Shake off those calories. Shake up that metabolism. During the break, I didn’t write much. I jotted down ideas for stories, wrote a first draft of a letter to a comedian I think would be curious to read my book “Hitting Water”. The book kicks off and is inspired by a mutual friend of ours who passed away years ago, and she may smile while reading it. I read a book about Phil Hartman and have started Tony Robbins’ tome about money (which kind of depressed me). A bit thirsty for fiction, I cracked open Pulitzer prize winner “The Goldfinch” by Donna Tartt (whose book was featured in a clue on Jeopardy last week). This book is lovely, dense, and it’s my road map on WTF it takes to write a Pulitzer prize winning book. Just reading Ms. Tartt’s biography, and I could see why. She has some pretty intense writing chops. Lots of literary weight there. 2015. You better be good to me. 2014 was a terrific year. I didn’t let life happen to me. I created the building blocks of making life happen. My book “Hitting Water” was released in December – just when I was ready to shut down for the year. No major promotion has been made yet, but I’m getting there. It was one thing writing my own book. It’s quite another to get on one’s soapbox and promote it. That takes a whole different set of conjones to get that done. I’m mustering up the strength, the inner confidence and the ideas to get this done. I’m still in a twilight. Last night’s dreams are still floating in my brain. I had a dream I was on a business trip to New York City and was staying in a cute studio apartment. Alec Baldwin entered my dream as Jack Donaghy from ’30 Rock’. He told me I must join a dinner that evening with a client and Liz Lemon. The evening came, and I totally forgot. I was so pissed that I was just lolling about, letting the evening go by, when it hit me that I was missing this dinner. Strange. I guess watching those episodes of ’30 Rock ‘ on my computer last night seeped in, coupled with the inner fear of letting responsibilities fall by the way side. Because I’ve let them slide these past few weeks. It’s just the first day back into the thick of things in a new year that shows promise. It’s just my tights are bugging me and I want to go back to sleep to apologize to Jack Donaghy for missing that dinner. Categories: Monday's Meditation | Tags: Hitting Water, Writing | Permalink. “Hitting Water” in Paperback now! Available on Kindle December 14th! 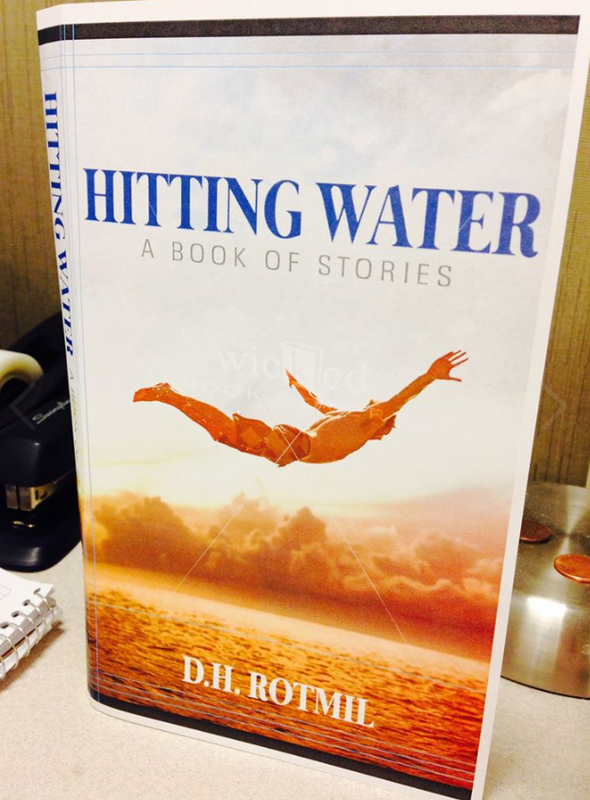 “Hitting Water” available in paperback on Amazon now! Available on Kindle December 16th! It’s a firm go on “Hitting Water”! It’s available on paperback now over on Amazon, and will be available on Kindle December 16th! 14th! Right now my book is listed #328,177 in Amazon’s book list! Woo hoo! Only way to go but up! Thanks for your support on this. I’d love this to be an open conversation on publishing. This isn’t only a book about Jane Dornacker and the various fictional characters who unfolded to create the theme of life’s brief candle and how we cope in the throes of chaos and sadness. Or how people come into our lives, burn bright and leave us too soon, helping us appreciate the life we’ve been given. Nope. It’s not just that. The very fact this book was written should be an inspiration for people like me – who get lost in the day to day of jobs and family, who have a burning desire to create something – anything – art, writing, teaching – anything, before we leave this earth. You CAN accomplish your personal goals a little bit every day. Before you know it, you’ve created something for people to see. Something that didn’t exist before. That’s what this book is also about. Please feel free to leave your comments on Amazon or below. If you have questions about how to get jazzed to write daily, or how to even approach self publishing while defying fear and personal set backs – I encourage you to comment. Let’s make this a conversation! Categories: Hitting Water | Tags: Amazon, Hitting Water, kindle | Permalink. 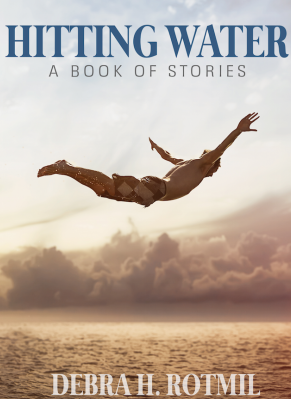 “Hitting Water: A Book of Stories” Is Out on Amazon Now! “Hitting Water” Out on Amazon now! 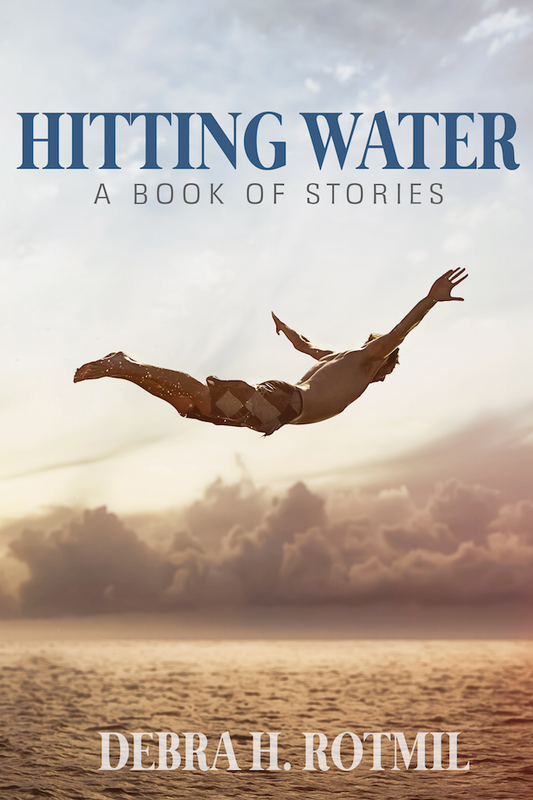 “Hitting Water: A Book so Stories” is out on Amazon now! Paperback is available for purchase. Kindle will be available by end of the week. It’s my hope that these stories will touch you – perhaps make you think about some of the people who’ve entered your life, made you feel happy, sad, disturbed and loved. The fact this book exists is a testimony to following a dream and seeing it through. This is the first of many books I hope to write. May it inspire you to write too! Categories: Self Publishing | Tags: Amazon Books, Hitting Water | Permalink. 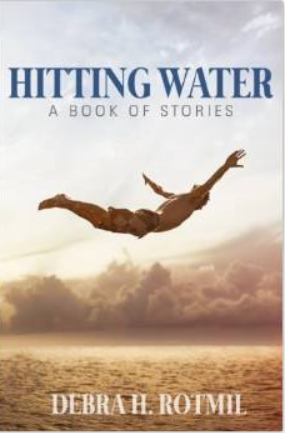 It’s the end of the week, and another opportunity to look back on some accomplishments regarding my forthcoming book of stories, “Hitting Water”. Above this blog post, you will find a print out of the mock cover, all bent in the shape of what will be an actual 3-D book (in addition to the Kindle version). The computer-to-print conversion is not exactly what it should be here – but it’s quite close – and will look much better when officially printed. I love it! It’s my hope that many people read it and find some beauty wrapped within the words. The memory of the late, great Jane Dornacker was the driving force behind these stories, weaving the concept of life’s brevity and how various spirits who enter our world lend out lessons about life and death. Jane’s story is the only autobiographical one in the collection. The rest are fiction, yet inspired by people I’ve known and re-imagined in fantasy pieces about life, the chaos of mental illness, death and a little of the afterlife. It’s a short read, and I hope it inspires people to think about life a little differently. As someone who has lived a conventional path in the name of security – writing this book is a big step for me. It’s the first in many I plan to write, as I fulfill my love for writing and getting it out for all to see. In that regard – I hope I inspire those who are stuck in a rut and feel they are destined for something else – whether it’s writing, painting, singing or building a house. The book is currently in that limbo phase – where the edits, re-writes and proofs are done and the manuscript is being formatted for book and digital. So, I wait it out until the final version is done for uploading. Although there is no publication date yet, the book should drop on Amazon by mid December, followed by Kindle sometime thereafter. Once I know the date – it will be announced. So, while I wait – it’s on to the next book! I’m currently outlining a book about my life as an Administrative Assistant and brainstorming a SciFi book along the lines of “Hitchhiker’s Guide to the Galaxy”. Fingers are cross that creative flow will happen and thy work will be done! Categories: Friday's End of Week Musing | Tags: Hitting Water, self-publishing | Permalink. I’m writing this blog post in a blur, practically on autopilot, and it might not make sense…. But here goes! So the process continues! I’m really excited. My book is getting to the marketing stages – prepping for the publication with Amazon, and I’m learning the hell out of this business. The craziness lies in my day job – which has just recently had a re-organization, so things are getting super busy. Juggling new responsibilities and trying to bring out the theme and subtext of my short stories to a marketing expert at Createspace (which is the platform that brings a self publisher’s book to Amazon and the world) so she can write a back cover blurb, categorize the book for search engines, devise snazzy ways to make me interesting to the passing Amazon buyer. The cover above is just another mock up. A really wonderful artist from the UK I found via Fiverr.com put this together using the photo I selected, and it looks awesome! The only thing is – during the time it took for her to do it (where there was radio silence and I kind of thought I just threw away $30.00) I found another really terrific artist who is pulling it together, along with formatting the interior of my book. 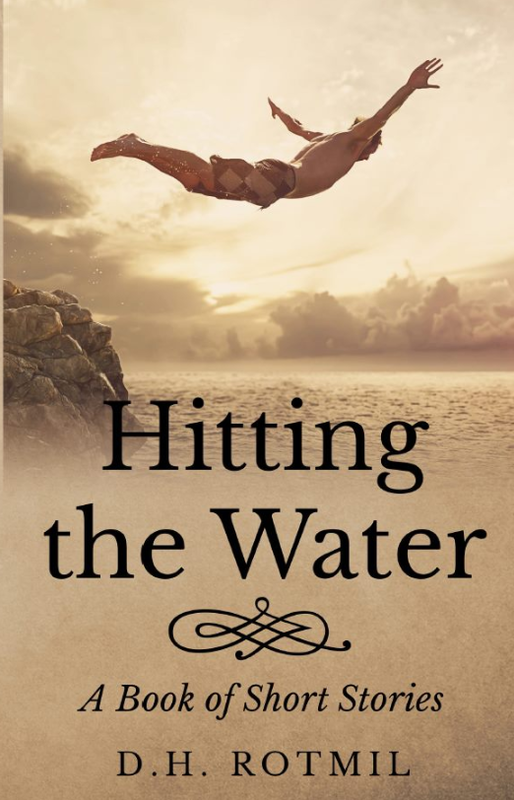 I also trimmed the name of my book to “Hitting Water”. So, although the photo will be the same – the titling should be different. How about the color? I was thinking of making the sky blue maintaining the sepia in the water, diver and rock. I’d love your input! Please comment! Categories: Monday's Meditation | Tags: Hitting Water, self-publishing | Permalink.